Was this behind the scenes of the movie? 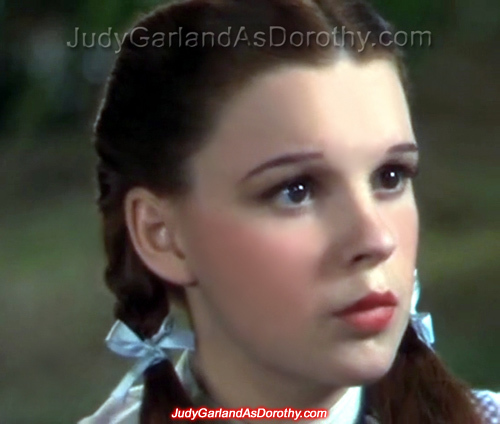 Yes, it shows an innocent Judy Garland as Dorothy in real closeup with her wide eyes and full lips. This picture isn't available anywhere else but here. wow where do you get these pics from, i'm actually searching for rare photos of Judy i know there are more than whats on google. Yes there's certainly more, I have some photos of Judy Garland as Dorothy that I haven't seen on the internet. MGM grabbed the opportunity to take many photos of her in their most expensive film at the time. i seen a couple of rare pictures of her in the movie, like one with her in make up and a blonde wig next to the munchkins but you probably have more though. I think I've seen that one. I think Judy Garland as Dorothy looks more beautiful and innocent with her brownish red hair and the pigtails opens her face. I've posted many publicity still photos of Judy Garland as Dorothy over the years but there's a publicity still shot of her in the Cornfield scene and the Apple Tree scene that I haven't seen elsewhere, but they will be posted in the future among others. Awesome! looking forward to seeing them.